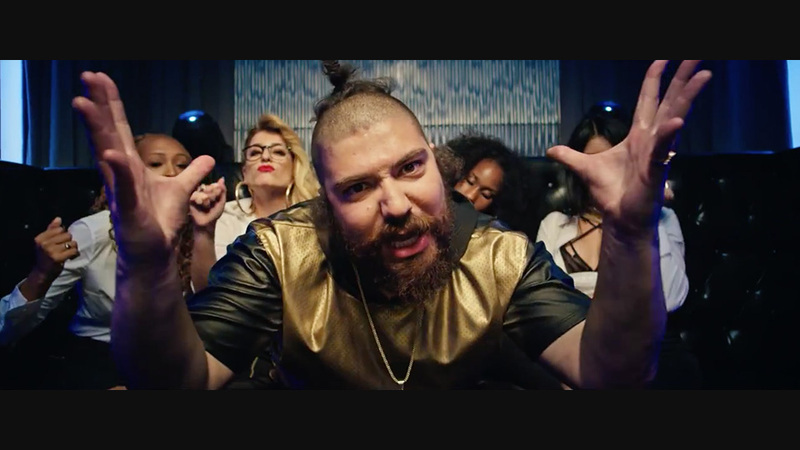 The title of Viacom Velocity's three-minute music video "The Fat Jewish Is Big Data Featuring Todrick as Hadoop" pretty much says it all. What don't you understand? Social media star/E! Channel interviewer Josh Ostrovsky—better known as "The Fat Jew," but just feeling vaguely Jew-ish here, I guess—stars as the burly, bearded, rapping personification of Big Data. Singer/dancer Todrick Hall, whose MTV docu-series drops in August, appears as the rapping personification of Hadoop, the open-source software framework. M.C. Python's in there too, also rapping, along with Kern Schireson, Viacom evp of data strategy and consumer intelligence, who keeps his mouth shut. Dat crew burns da mutha down! I think. At any rate, this extremely silly clip works hard to generate some laughs as it promotes the integrated marketing, branded content and insights unit of Viacom's ad sales operation, stressing, in cheeky hip-hop fashion, the ways in which Viacom Velocity employs data to solve clients' problems. Some lyrics: "I know you're struggling, I can feel your pain/Your profits they be falling, and circling the drain/You're selling beer to babies, diapers to teens/You barely even know what you customers need." Some more: "Maybe you should check what kind of data your usin'/And whether it illuminates what everybody is choosin'/for their cars, their clothes and telephonic devices/Yeah, that would be priceless." Niels Schuurmans, evp at Viacom Velocity, explains: "We thought rap worked perfectly as a way to infuse all the data jargon being thrown around, and a rap music-video parody was perfect coming from the company that made the music-video genre famous." The unit's gone the social-satire route before, producing a video earlier this year spoofing, and also analyzing, after a fashion, the social-influencer phenomenon. The primary target of the rap video "is mostly b-to-b, our agencies and client partners who understand, as we do, the importance of tapping Big Data to target fans and consumers across the media landscape," Schuurmans says. "We also wanted to create a b-to-b video that is entertaining enough to appeal a broader audience." They've succeeded as well as could be expected, given that rap parodies of anything, especially in the business and technology realm, feel a little old hat. Even so, Fat Jewish and Todrick deliver the goods with a zany energy that's hard to ignore. "They have substantial fan bases, and they're blowing up in social," Schuurmans says. "If you know them, it's a big win, and if you don't know them, it doesn't really matter because they're so great in the video. We consider it a coup that these social superstars agreed to partner with us on this creative." What say you, Fat Jewish? "Our schema is suprema, our analytics strong/Always aggregate, until our data's long/Got so many petabytes it makes a grown man cry/And you'll be making crazy bacon cause our Pig's so fly."